With 40 million homes trusting their door handles and locks to Schlage, we are proud to announce that we offer the Schlage Primus key control system. The Schlage Primus high-security key control system is precision built to extremely close tolerances and the highest standards of quality. Dual locking cylinders consist of two independent locking mechanisms, operated by a single specifically designed Primus key. 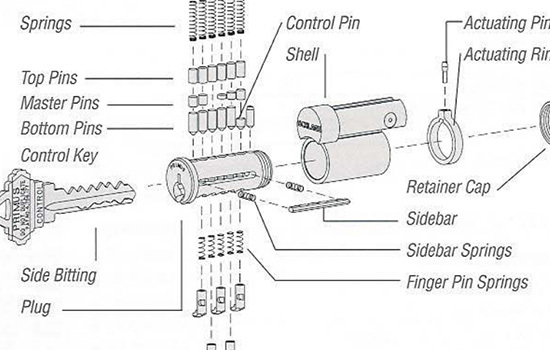 Primus key control systems have 6-pin tumbler mechanisms supplemented by an independently controlled sidebar 5-pin mechanism that interfaces with the side bitting. Side bitting is a unique “fingerprint” of the key, and this fingerprint is then used to geographically control the distribution of patented Primus keys. Applications: Fine homes, multi-family housing, retail, office or commercial space, institutions, industrial sites and anywhere else key control and physical security are top priorities.